This tiny house village allows drugs. Should it have been put in a high drug-traffic area? 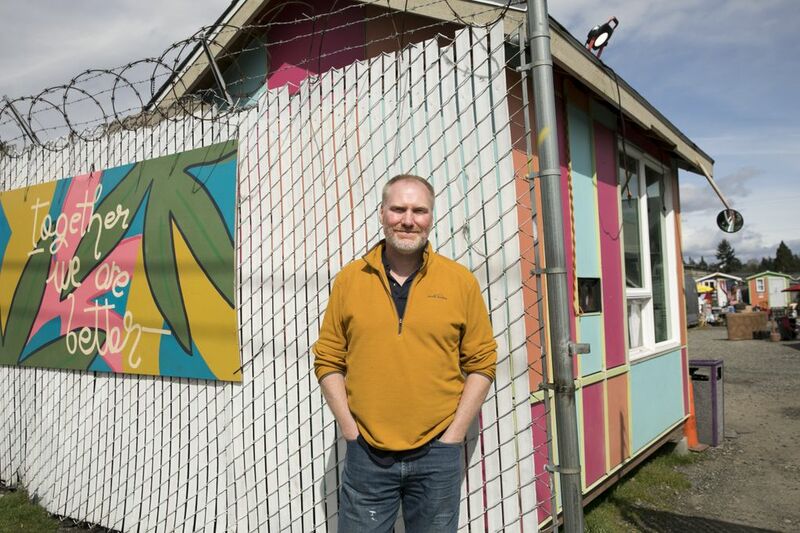 Seattle is experimenting with a tiny house village that allows drug use, but some in the nearby neighborhood don’t like being experimented on. Michael Armijo hasn’t had time to replant the tulips wilting in his planter box. He doesn’t like going outside anymore; all his extra time and money have gone into the surveillance cameras. 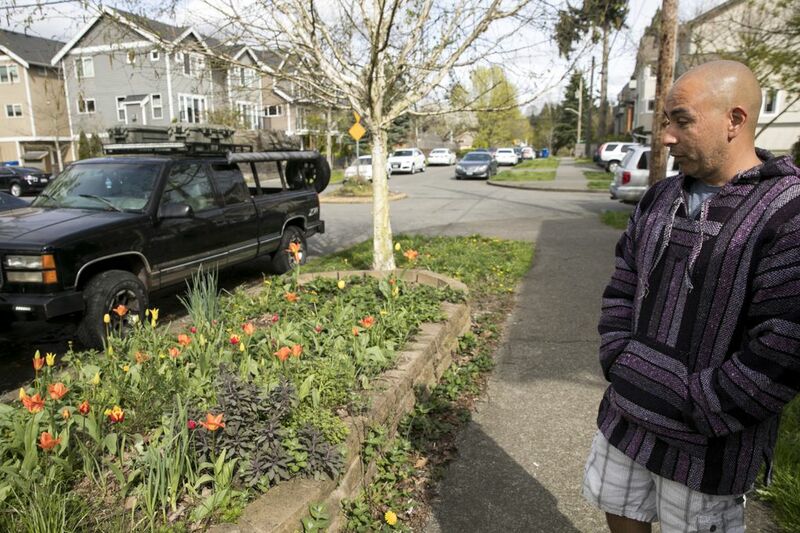 Armijo knew about the gritty reputation of his neighborhood, three blocks off North Seattle’s Aurora Avenue, when he and his family moved there in 2011; but when his family planted those tulip boxes back then, he felt the neighborhood was on the upswing. The last year has been different. Several times a week, Armijo sees people trying to shoot up drugs in his yard, look in his windows, and steal the packages from his front door. 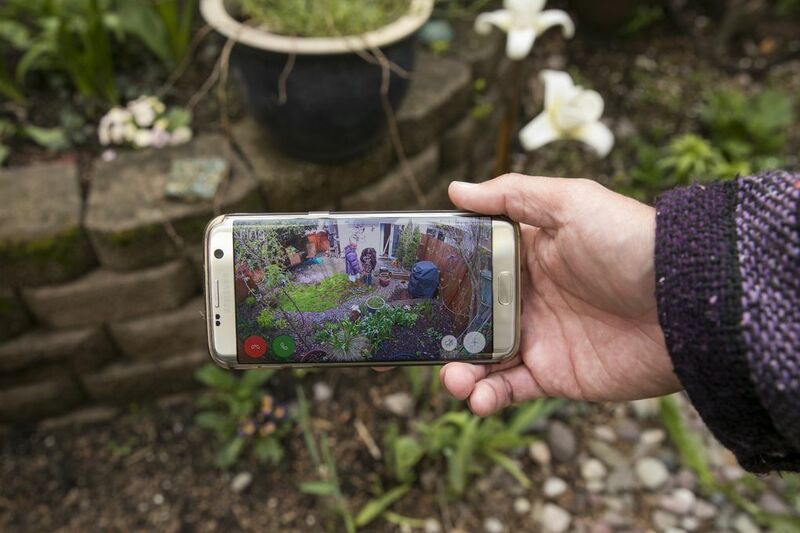 His 9-year-old son sleeps on the ground level below him, in a room with a sliding-glass door, so Armijo installed surveillance cameras and motion detectors to watch his backyard and front door. Armijo doesn’t sleep as well as he used to. He wakes up almost every night when the motion detectors alert his phone. And he blames it on one thing: Last April, in a dirt-and-gravel lot on Aurora, a 65-person village of tents and shed-sized tiny houses popped up inside a chain-link fence with barbed wire. It’s called Licton Springs Village. There are six such homeless camps operating on land owned by the city of Seattle, but Licton Springs is different in one big way. Other villages can ban residents for showing up intoxicated or using drugs. Licton Springs Village is designed for people with chemical dependencies. Seattle says this is the first encampment like it in the U.S., and the city will decide this week whether to renew the village’s one-year permit. The city is weighing the impacts on the neighborhood and trying to set criteria for success in a second year, according to Meg Olberding, a spokesperson for Seattle’s Human Services Department. Licton Springs Village is an experiment. But some neighbors feel that taking a lot of people who already use drugs — half of whom came from sweeps around the city — and putting them in a place where drugs were already a problem, was a bad idea. The Licton Springs neighborhood — named after a bubbling, muddy spring which the Duwamish tribe and European settlers believed had healing powers — is divided over this issue. In its public comment period, the city received over 250 comments, evenly split for and against the village, according to Olberding. In all, 17 people have left the camp for permanent housing in the past year, and one overdose has been stopped by a staff member with Narcan. One thing is clear: The tiny house village is a cheap way to house people in the midst of a crisis of homelessness. It cost the city almost $600,000 in the first ten months of operation; that’s $28 per bed per night, less than half the cost of a bed in the newer enhanced shelters. But there has been a clear impact on the neighborhood. 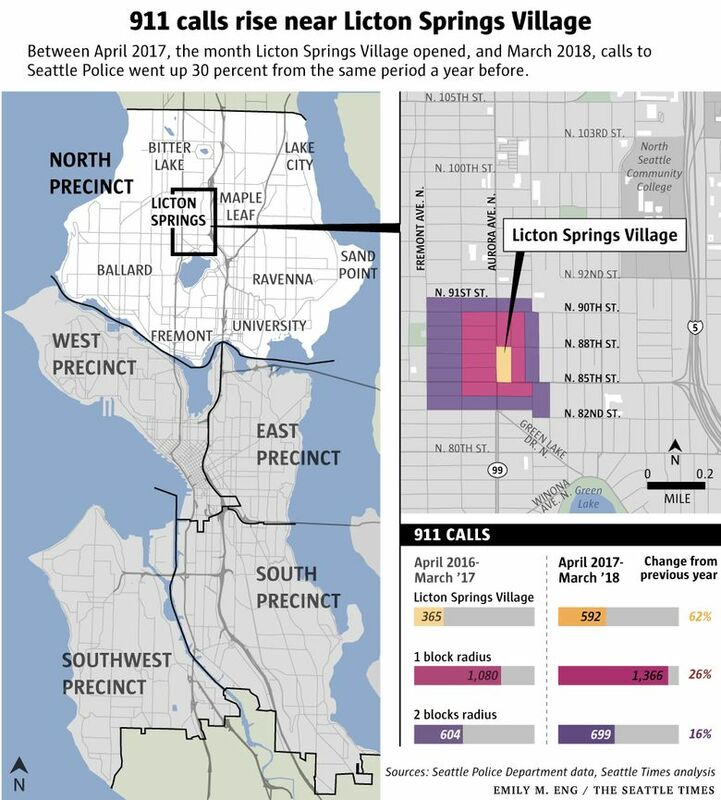 A Seattle Times analysis of 911 calls from April 2017, the month the village opened, to March 2018 showed that within two blocks of Licton Springs Village, calls went up 30 percent from the same period a year before. Calls just on the block where Licton Springs Village is — a block with fewer homes and more cheap motels, a Jack in the Box and a church — went up 62 percent. Police have responded in kind, according to data from SPD: Officers radioed in 221 percent more incidents in 2017 than in 2016 on that block. Captain Sean O’Donnell, who runs the city’s north precinct, said he made sure that beat officers increased their presence after the village opened. But he says Licton Springs Village is just one piece of a complicated puzzle in an area that’s struggled with drug crime since he started in Seattle in 1981. The area running up Aurora from 85th to 115th got more calls and incidents in 2016 and 2017 than any other beat in the north precinct. Darryl Ulskey was one of the neighbors who opposed the village when it was first presented over a year ago. He owns an apartment building within two blocks of it, and he’s lived in the neighborhood for over 40 years. When it became clear the village was going to launch there in April 2017 — on land owned by Seattle’s Low Income Housing Institute, an advocate and provider of homeless services — Ulskey decided to join the Licton Springs Community Advisory Committee, intended to keep the village connected to the neighborhood. He visited the village, and his mind changed. Most villagers have disabilities, mental and physical. One man was transferred into Licton Springs Village last spring after losing two toes and a finger to frostbite. 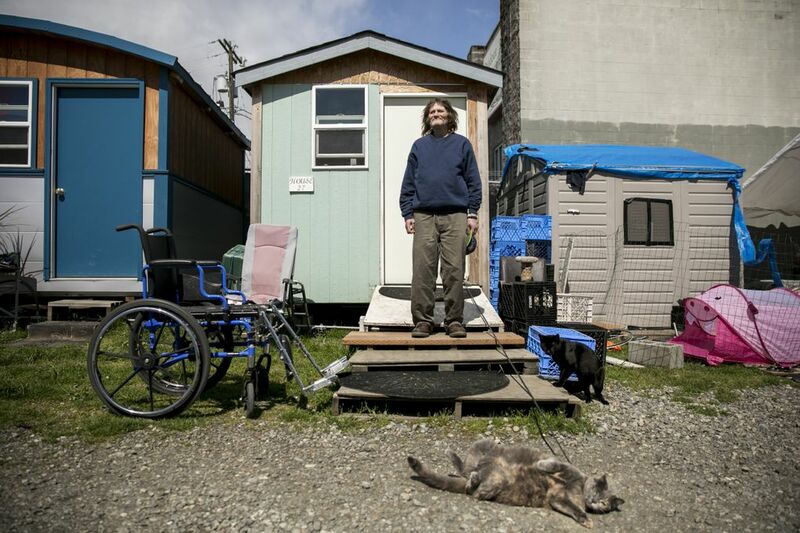 A woman injecting heroin to deal with the pain of osteoporosis had been sleeping outside in a wheelchair. And many, Ulskey found, want to get into treatment. Ulskey also met staff, many of whom had been homeless in the past. 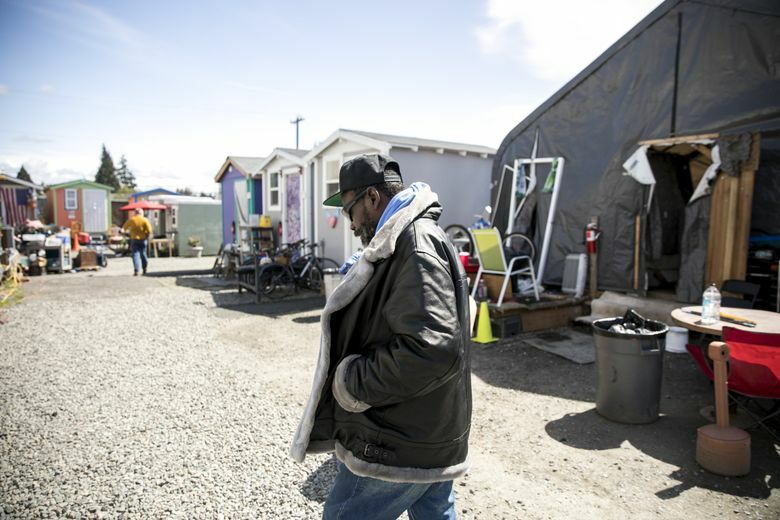 Charlie Johnson, who became homeless a few years ago after a hard episode with benzodiazepine tranquilizers and alcohol, was living in a tent city in Interbay when he got his job at Licton Springs Village. The goal of the staff is to stabilize the residents’ lives enough that they can get housing, such as by getting identification cards and onto waiting lists. Staff can also help people access a methadone clinic or treatment if they ask. But Johnson views their main job as keeping villagers safe, not stopping or reducing residents’ drug use. One of the residents is Sana Ceesay, a refugee who says he fled Africa in 1994 after a coup in Gambia. Ceesay left his family behind, married an American here and started working temp jobs. During a particularly hard point in his marriage, Ceesay was introduced to crack cocaine. He and his wife separated in 2011 and he lost his job because of his drug use. He started moving around the Puget Sound area, sleeping rough. Ceesay has scars on his face from his time on the street. He’s fearful all the time that people around him are trying to kill him, and he’s so anxious at times that he can’t speak. “When I use, I realize I forget about what is happening with my wife and my problems,” Ceesay said. 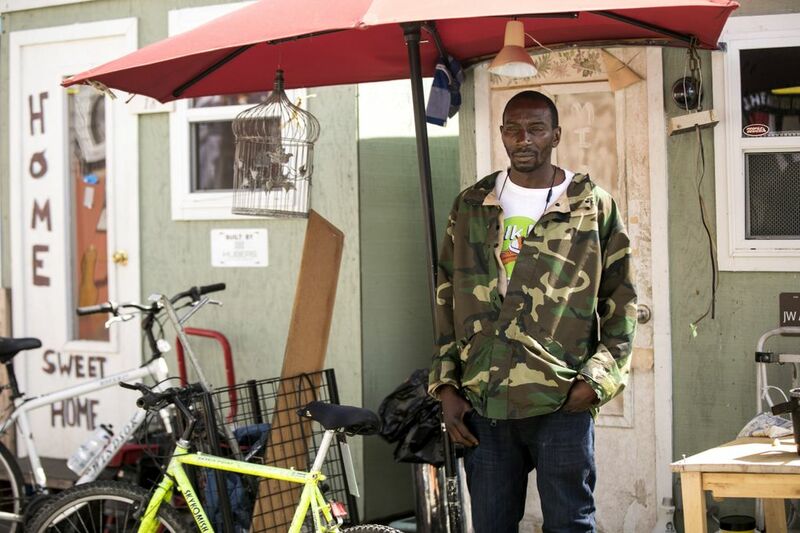 Since moving into his own tiny house, a mint-green shed with a red patio umbrella out front, Ceesay started going to treatment meetings. He’s been sober for 27 days. Putting a lock on his door has helped him put a lock on his brain. Seattle has used the so-called “low-barrier” model before, although not in a sanctioned tent camp. In 2005, under controversy and a lawsuit, the 1811 Eastlake building began housing chronically homeless people with alcoholism and allowed them to drink in their rooms. Research studies found the building saved about $4 million a year in emergency social and health programs, and that residents’ alcohol use decreased once they moved in. A class of University of Washington graduate students completed a study on Licton Springs Village during winter quarter this year, and found that four in five residents described their lives as being more stable. But the study also revealed discord in the camp, which is managed by the activist nonprofit SHARE/WHEEL. Less than half of the residents said they trust their staff. Several people on staff also said Licton Springs Village is understaffed and the staff lacks supervision, training and sometimes even support for things like trash disposal and supplying clean needles, according to the study. Although 17 people from Licton Springs Village have gotten into housing, that is lower than other city-sanctioned tent camps of a similar size, which got an average 30 people per tent city into housing in 2017. Armijo, who manages a primary-care clinic in Mukilteo, was supportive of the village when it opened but now says his neighborhood has been forgotten. He says he’s called 911 on people using drugs outside his house and, sometimes, police never show up. Other neighbors said similar things. But often, the neighbors who disagree, like Armijo and Ulskey, do agree on one thing: The problem is not the people in the tent city. It’s what came with them. When Licton Springs Village opened, some in the neighborhood pushed to have it only house people from the Licton Springs area. 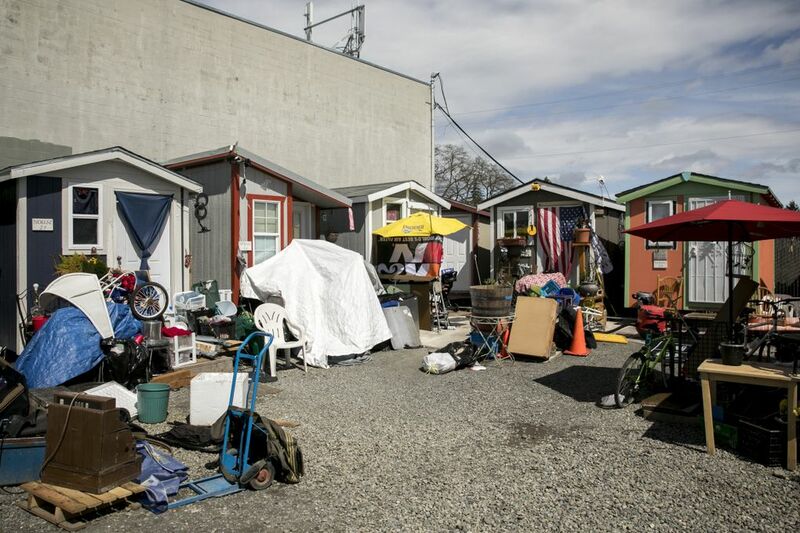 But Seattle decided that wasn’t an option: The city is cleaning up unsanctioned camps across Seattle, and under rules set by the City Council, displaced campers must be offered a spot in a shelter or tiny house village. In the beginning, most of the campers moved in from out of the area, according to Johnson. And that probably raised the demand for drugs in the surrounding blocks, Johnson admits. “It’s hard not to imagine 60 people making a difference,” Johnson said. To Amber Matthai, who lives a block and a half from Licton Springs Village, having drugs around is nothing new. Her father started using heroin when she was in high school. On her way to graduation, she saw her dad on the street, standing there, zoned out. Today, he has drug- and alcohol-induced dementia and schizophrenia and is in assisted living. She visits him once a year. His memory from the time before he started doing heroin is still pretty accurate, but it is fuzzy from the years after he started using. That’s why she thinks the tent city should be shut down. “Helping someone dig their grave is not helping,” Matthai said. A previous version of this story misstated how much the city spent for operating costs on Licton Springs Village; the village cost the city almost $600,000 in the first ten months of operation.